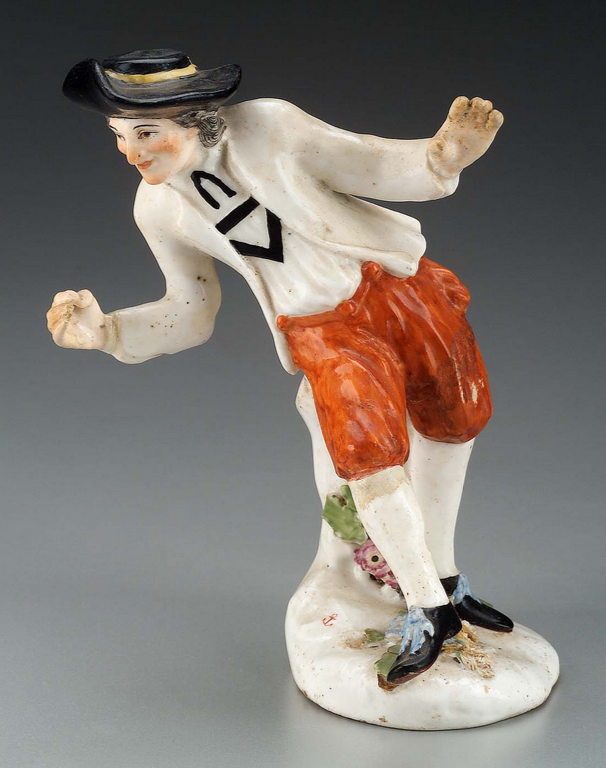 Dancing sailor figurine, Chelsea Manufactory, c.1753, Museum of Fine Art. Within the eighteenth century British Empire, porcelain figurines like this were collectible items that (though kitschy by today's standards) were common and sought after. Several of these depict sailors, as we've seen before on several occasions. This figure wears a black brimmed hat with white tape around the crown. His jacket is without any ornamentation (or even buttons) and ends at the waist. Beneath he wears a white shirt with some odd black symbols on it. I can't quite figure out what they are, but there is a thin black cravat under his collar. He wears orange breeches, white stockings, and black shoes that are tied with blue ribbon.